Since August 2017, there has been an ongoing outbreak of plague in Madagascar, Africa. Within 2.5 months (1 Aug - 15 Oct 2017), more than 800 cases were reported, including at least 60 deaths. Thirty-seven out of 114 districts of the country have reported cases (http://www.afro.who.int/health-topics/plague/plague-outbreak-situation-reports). Seychelles, Madagascar's nearby country, has also reported imported cases. In 1990s, plague prevailed in Asia and Africa, as shown in the map. 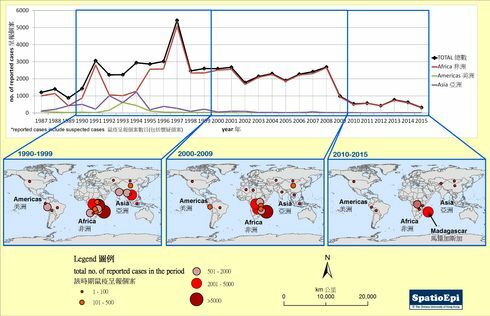 While plague was still widespread in Africa, the number of reported cases in Asia was small in the following decade (2000-2009). In 2010 and thereafter, the annual number of reported cases in Africa dropped significantly to below 1000. However, the outbreak in Madagascar this year is becoming a concern, as it pushes the epidemic curve up again. 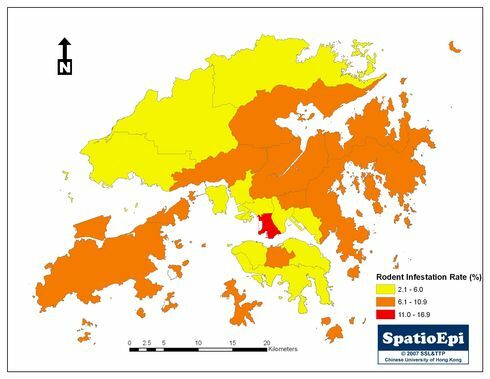 Plague is transmitted through the bite of infected animal's (mainly rodent) fleas. It can be classified as bubonic plague, pneumonic plague and septicaemic plague. Pneumonic plague can spread through respiratory droplets and is highly contagious. Around two-third of reported cases in the current outbreak in Madagascar were pneumonic plague. At least 39 healthcare workers were infected.